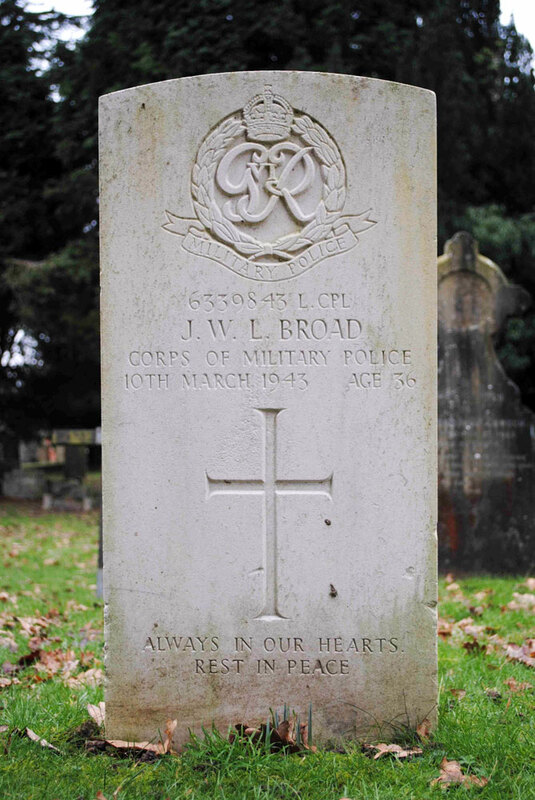 John Walter Leonard Broad was born on 30 October 1906 in Platt and was the son of a farm labourer named John Leonard Broad, and Louisa Ellen Fisher. In 1911 the family were living at Sotts Hole in Crouch, with John starting at Platt School on 11 March 1912. In 1935 John married Doris Isobel Gibson in Platt and they had two daughters born in 1936 and 1937 respectively. During WWII John served with the Corps of Military Police (No. 6339843) and had gained the rank of lance corporal when he died at Sevenoaks and Holmesdale Hospital in Sevenoaks on 10 March 1943. He had been suffering from acute nephritis (inflamation of the kidneys) and was usually resident at 7 Pine View Cottages in Platt. John is buried in Platt churchyard.